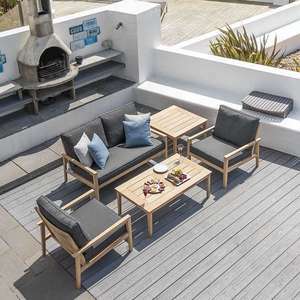 Bring the natural beauty of teak and hardwoods into your garden with modern wooden lounge sets, Hardy, wooden outdoor sofas and armchairs combined with the comfort of weather resistant or weatherproof deep seat cushions make these a lovely choice for casual garden lounging. 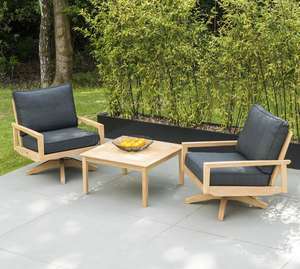 Hardwood Garden Lounge Set . 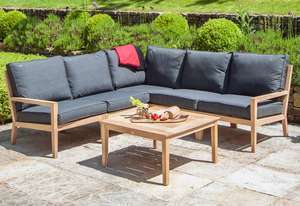 Roble 2-Seater Sofa, 2 Armchairs and 2 Tables. Priced as a Set. Hardwood Garden Lounge Chair Set . 2 x Roble Swivel Armchairs and Coffee Table.